Waiting on Wednesday is a weekly meme hosted by Jill at Breaking The Spine. It features each blogger's most anticipated books. 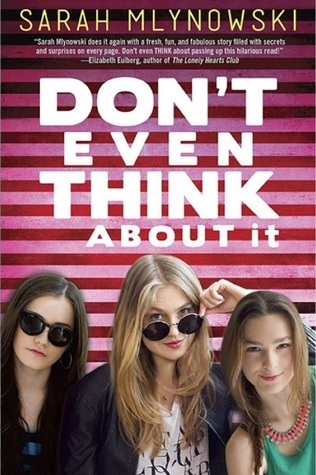 My pick this week is DON'T EVEN THINK ABOUT IT by Sarah Mlynowski. "Contemporary teen fiction with romance, secrets, scandals, and ESP from the author of Ten Things We Did (And Probably Shouldn't Have). We weren't always like this. We used to be average New York City high school sophomores. Until our homeroom went for flu shots. We were prepared for some side effects. Maybe a headache. Maybe a sore arm. We definitely didn't expect to get telepathic powers. But suddenly we could hear what everyone was thinking. Our friends. Our parents. Our crushes. Now we all know that Tess is in love with her best friend, Teddy. That Mackenzie cheated on Cooper. That, um, Nurse Carmichael used to be a stripper. Since we've kept our freakish skill a secret, we can sit next to the class brainiac and ace our tests. We can dump our boyfriends right before they dump us. We know what our friends really think of our jeans, our breath, our new bangs. We always know what's coming. Some of us will thrive. Some of us will crack. None of us will ever be the same. So stop obsessing about your ex. We're always listening." Why I Can't Wait: TEN THINGS WE DID (AND PROBABLY SHOULDN'T HAVE) is one of the funniest, best contemporary books I have ever read. I loved it, so it's kind of obvious that I will read anything Sarah Mlynowski writes. This book sounds hilarious and awesome. Telepathic teenage girls and high school drama? Bring it! Angie, you need to read it. It's HILARIOUS! I've just downloaded iStripper, so I can watch the sexiest virtual strippers get naked on my taskbar.